How rare is this cat ? The International Species Information Service lists 44 worldwide, with 5 being in the U.S. There are 0 living on Easy Street. Misc. : This cat was originally classified as 2 distinct species due to color variations. The red phase was called the "Golden" cat, while the gray phase was called the "Silver" cat. Today, they are recognized as a single species with 2 color variations. It is referred to in some areas as "the Leopard's brother" because they inhabit the same area. 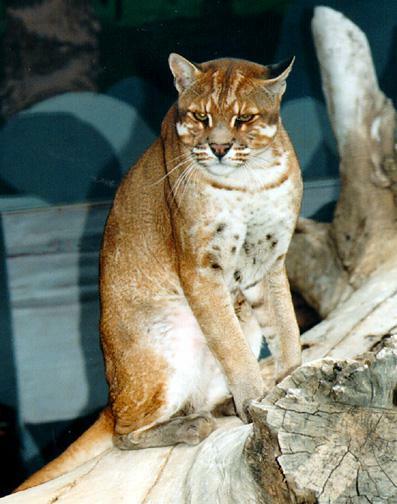 Size and Appearance: This medium sized cat weighs between 20-32.5 pounds, stands approximately 26-33 inches tall and reaches lengths of 46-54 inches. Like their African counterpart, their coat color appears in several variations, from fox-red to golden brown, but can also be black, brown or gray. 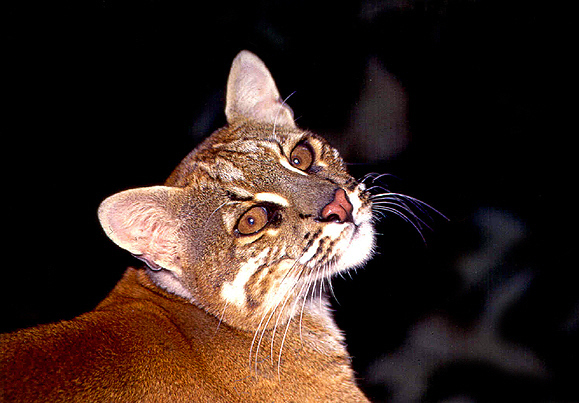 Their pattern can also vary greatly from plain to spotted, and includes, in one region, rosette and spot markings that resemble that of an Ocelot. 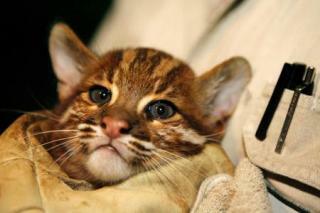 It is this Ocelot-like from that has been given its own distinct subspecies listed above. 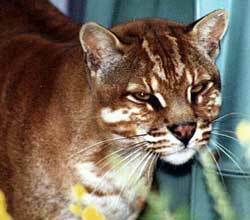 The face of the golden cat is marked with white lines running across its cheeks, and from the corners of its eyes up to the top of its head. Its ears are dark with a grizzled center. The underside of the last third of the tail, including the tip, is white. 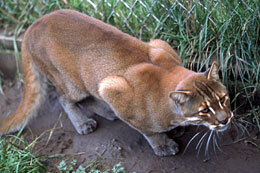 Habitat: Predominately found in tropical and sub-tropical moist evergreen and dry deciduous forests. Occasionally found in shrub and grassland. Distribution: The Himalayas, China, southeastern Asia, Malaysia, Nepal and Sumatra. Reproduction and Offspring: After a gestation of approximately 80 days, a litter of 1-3 kittens is born, with 1 being the average. Newborns weigh approximately 8.75 ounces at birth. Eyes open around 9 days and they are weaned at around 6 months. They reach sexual maturity around 18-24 months for females, and around 2 years for males. 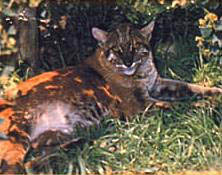 In captivity, Asian Golden Cats have lived up to 20 years, although the average is 12. Hunting and Diet: The primary prey of this cat is large rodents, amphibians and insects, birds, small reptiles and small ungulates. They have also been found to prey on larger animals like wild pig, sambar deer, and young calves of domestic water buffalo. Principal Threats: Deforestation and hunting for its pelt and bones. Livestock depredation has also been an issue. 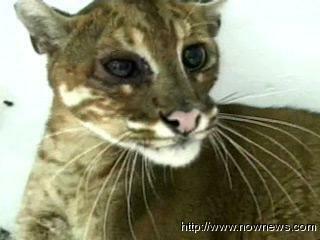 Status: CITES: Appendix I. IUCN: Indeterminate. Colouring Golden to dark brown, white lines on cheeks and from eyes to crown. Some individuals heavily spotted on flanks. Asian golden cats have long been known in Myanmar (Burma) and Thailand as ‘fire cats’. Legend says that carrying one hair will give the bearer protection from tigers, or burning the pelt will drive tigers away from the village. 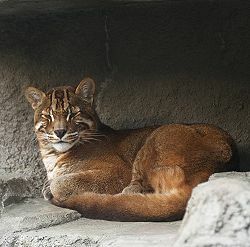 Sturdily built with fairly long legs, the Asian golden cat is a medium size cat, with fox-red to gold-brown, black, brown or grey fur. Melanistic examples are not uncommon. There is a variation, thus far reported only from China, of ocelot-like rosettes and spots, which looks so unlike the plain form that some taxonomists have considered it a separate species. The moderate length, dense coat is generally unmarked, but those cats in the more northerly regions often exhibit spots and stripes that closely resemble the markings of the leopard cat Prionailurus benagalensis. The most conspicuous features of this cat are the white lines bordered with black running across the cheeks, and from the inner corners of the eyes up to the crown. As with most cats, the underside and inner legs are white, and there is a white patch on the underside of the last part of the long tail, which is roughly 1/2 to 1/3 of the total body length. The backs of the short, rounded ears are black, with a whitish central area, and the eyes are usually greyish green or amber. 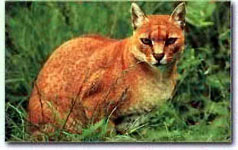 The Asian species appears to be closely related to the African golden cat Profelis aurata although the two are separated by more than 6,400 kilometers. It is thought that about one million years ago forests covered the area from Senegal to China, a region now broken by vast deserts. 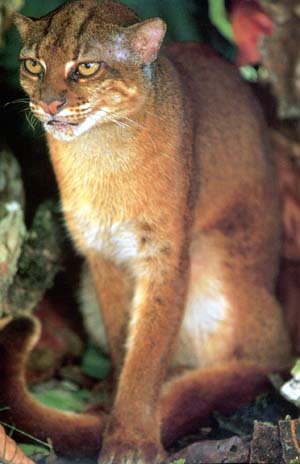 Over the years, the deserts probably isolated the two golden cat populations. 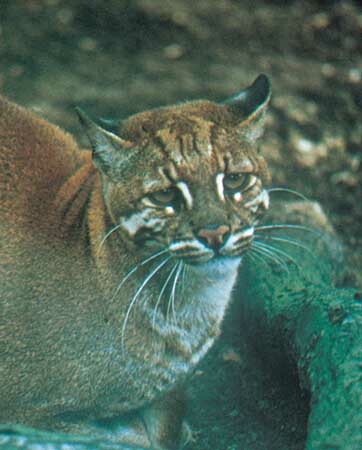 The Asian golden cat is a nocturnal forest dweller, preferring deciduous and tropical rainforest, and occasionally more open areas with rocky tracts. In parts of China they are known as the ‘rock cat’. 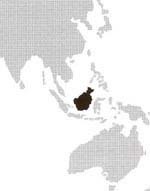 They are found from Nepal and northeast India through southeast Asia, China, Thailand, Malaysia and Sumatra. 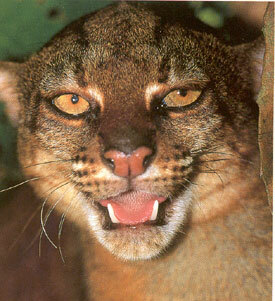 Unlike the African cat however, the Asian species is considered to be more abundant throughout their range. Although they can climb well, they spend most of their time on the ground, carrying their long tail curled up at the tip. They are reported by tribesmen in Thailand to have their young in the hollow of a tree. Opportunistic hunters, they prey on a wide variety of rodents, birds, reptiles, young hares, muntjacs and water buffalo calves. They have also been known to prey on poultry, sheep and goats, and it is for this reason that the cats are actively hunted by the villagers. After a gestation of 75 - 80 days, one to three kittens are born, weighing approximately 250 grams. Their eyes open at around nine days, and they are weaned at six months. 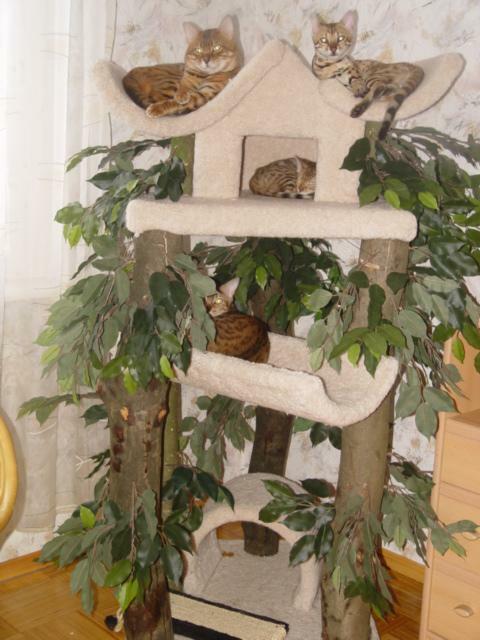 Kittens have longer, thicker coats than the adults, but show no pattern. They are slightly darker than the adults. This attractive Asian carnivore has in the past been fairly common in European zoos, although their reproductive rate was not particularly good. Worldwide, there are less than a dozen in zoos, with only four or five females in breeding situations. There is a high incidence of females being killed by their mates, even in well established pairs. Maximum longevity has been reported at 20 years. 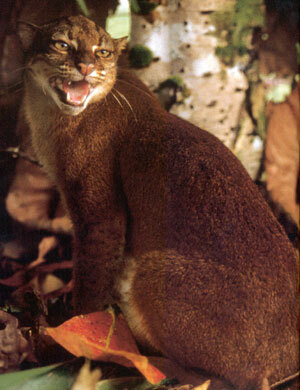 The Asiatic golden cat is widely reported as uncommon and threatened by deforestation. Major threats also include hunting for their pelt and bones. Their meat is considered a delicacy and the whole animal is often roasted on a spit. The bones are then sometimes ground into a powder to be given to children for fevers. Livestock predation, which usually leads to persecution, has also been reported. Although they are reported to be decreasing in India and Indonesia, no factual information is known of their status in the wild. Hunting is allowed in Laos, Bhutan and Brunei. CITES has placed them on Appendix I.